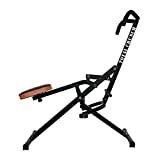 Full body fitness machine to work back, shoulders, glutes, abs and more! So simple to use and just as easy to store, thanks to the fold away design of Total Crunch Body Revolution, this exercise and resistance trainer is perfect for working your back, shoulders, pectorals, biceps, triceps, abs, glutes, hips and thighs, all with one swift movement. Combining four fantastic strength exercises i.e. leg press, squats, abs and back, with a special aerobic exercise, this fitness machine is brilliant for not only calorie burning, but also supporting body toning, doubling up as a fantastic body and ab trainer, plus cardio! Best of all though, you are not limited to the exercises you can perform with Total Crunch Revolution folding multi gym machines, as simply altering the position of your arms will mix your routine up! Also, if you like to pump up the resistance or fancy a gentler body workout, you can adjust the resistance by moving your feet to the top pedal or bottom pedal; it really is as easy as that! Total Crunch is a flexible option that will work around your busy schedule.